ABOMEY-CALAVI: “Darkness has fallen on the kingdom,” the prime minister of the Abomey kingdom in southern Benin told the 300,000 people gathered to mark the death of traditional monarch Dah Dedjalagni Agoli-Agbo. The celebration at the weekend of the ancestral king’s life is the beginning of at least six months of funeral rites, following his death and burial in July. The rest will continue in the privacy of the royal courtyard. “Tradition says that fever grips the kingdom for as long as the funeral is not held,” said Dah Sodjo Kehnounhon, royal advisor and funeral organizer. “The death of the king plunges his kingdom into darkness. No celebration may take place until the king’s ceremonies have ended.” The crowd witnessed ritual sacrifice of a goat, followed by the deep ring of gongs signifying the start of the ceremony. Dignitaries, princes and courtiers from the region, bare-chested and wearing loinclothes, sat crossed-legged in two long columns outside the palace. Government officials and royals from around the country also made the trip to Abomey, once the capital of the 400-year-old kingdom known as Dahomey, the former name of Benin. Agoli-Agbo’s ascension to the throne of Dahomey in 1989 was disputed, with some not recognizing his rule until 2010. A police officer by training who had 41 wives, his age was also argued but was said by his younger brother to have been 84. The former kingdom of Dahomey had vied for control of the Gulf of Guinea region and was renowned for its fearsome women soldiers and rich from the slave trade. “Under the twelve kings who succeeded from 1625 to 1900, the kingdom established itself as one of the most powerful of the western coast of Africa,” according to the UNESCO website. In the past, great numbers of people were sacrificed to accompany the king into the spirit world, according to Oxford Reference, but not anymore. 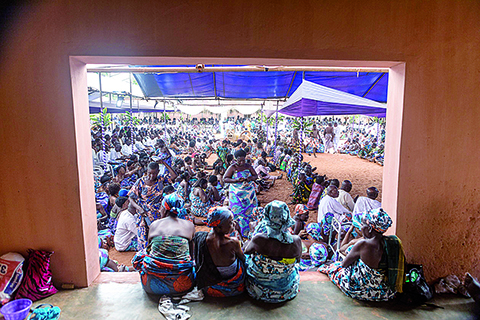 In modern Benin the constitution does not recognize kings and other traditional chiefs. Their political power ended when King Behanzin was deported during the colonial struggle against France at the end of the 19th century. Still, they retain great influence on the city and their subjects, a testament to the power of tradition in the region, where voodoo is practiced alongside Christianity and Islam. Agoli-Agbo, who had an immaculate royal pedigree, worked on the renovation of several palaces, turning them into tourist attractions in the small West African country.